Spring in Japan is invariably associated with cherry blossoms (sakura). The sight of hundreds of majestic cherry blossom trees blooming along the river banks in Japan and casting showers of light pink petals on the sidewalks is simply a magical experience that stays with one forever. 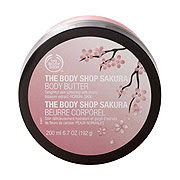 To be honest, I'm not a big fan of sakura-fragranced products or sakura-flavoured food but I do like the look of the Body Shop's Sakura collection which will debut on 23 February in Japan. 3. Sakura Eau de Toilette, 3990yen for 50ml: Top notes of magnolia, Fuji apple and osmanthus; middle notes of star jasmine, sakura and persimmon; bottom notes of fruity musk, hinoki cypress and sandalwood. New promo visual featuring actresses Nakatani Miki (left) and Shibasaki Kou (right) for Coffret D'Or's forthcoming base makeup range, which will be launched in Japan on 1 March. 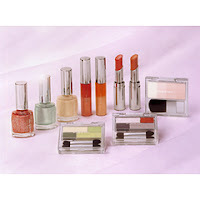 Maquillage will be launching a new base makeup collection for Spring/Summer '08 on 21 February. 2. Climax Water Compact UV: two-way foundation (that can be applied with either a dry or wet sponge) with SPF24, PA++ in 8 shades. 1050yen for case and 3360yen for the refill. Ettusais will be launching two new powder foundations, Zero Pore Oil Block Pact and Zero Pore Dry Block Pact (3150yen, 11g, 7 shades) on 21 February. Both contain a non-chemical sunscreen of SPF12 and PA++, plus they are also oil-free, fragrance-free and formulated to combat acne. There will also be two limited edition cases retailing at 1050yen each. 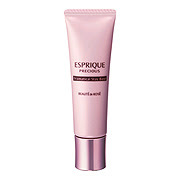 Promo image for the forthcoming Esprique Precious new base makeup collection. The campaign theme is "Fumetsu no Face" which translates loosely as immortal/indestructible face! One of my new year resolutions was to cut down on my spending on makeup, especially for items that I am unlikely to use often. I was doing quite well resisting most of the spring collections until I chanced upon this Paul & Joe makeup set at Isetan last week. 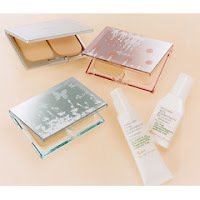 The set includes a Pressed Powder in #4 Iris, Blotting Paper compact with mirror, Eye Gloss #4 Marbre, Moisture Lotion 25ml, Light Cleansing Milk 25ml, Whitening Emulsion 5ml, the limited edition box from the Christmas collection of 2005 and a white plastic pouch. All for only S$90, which was quite a good deal considering that the Pressed Powder retails for $67, the Blotting Paper compact is $19 and the Eye Gloss is $35. As the counter was offering a GWP of this lovely tote bag with a phone case with purchases of $120, I also got the Face Color in #9 ($35). I liked the green and black floral print much more than the cat print from last fall's collection! According to the SA, the spring collection will be launched after Chinese New Year. The Kate website has also been updated with the new spring collection. Check it out here! 4. Toning Lotion (945yen for 60ml, 2940yen for 200ml): Formulated with a "Soft Smoothing Polymer" and witch hazel for reducing the appearance of pores. The three new TV CMs featuring Ebihara Yuri and Ito Misaki can also be viewed here. Check out Lavshuca's newly updated website for its spring collection, plus the new TV CM and wallpaper. The beige-themed collection is not really my cup of tea but the Puffy ladies do look gorgeous in the new CM. Promo visual for RMK's Spring '08 collection, Shiny Mix Dots which is inspired by Gustav Klimt. The Majolica Majorca website has been updated with the Spring '08 collection. The "Glossy Glamorous Girl" collection features 3 Majolook (Trick On) palettes, 3 new duo-toned Honey Pump Glosses and a revamped Lash Enamel Glamour. 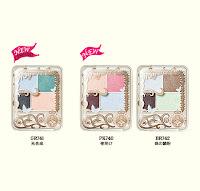 The Majolook palettes feature a new "Trick On powder", which is located on the bottom right side of the palette, that can be used at the inner corners of the eyes or patted in the middle of the upper eyelid for added sparkle and glimmer. 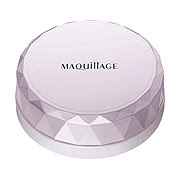 The Majolook (Trick On) palettes currently have an average rating of 4.5 stars (out of 7) on Cosme.net with many reviews commenting that the eyeshadows are on the sheer side but the Trick On powders do add a very pretty sparkle with flashes of gold or green (depending on the individual palette) without being too over-the-top. The new Lash Enamel Glamour Neo has received rave reviews on Cosme.net with an average rating of 5.5 stars with many users praising the glossy jet black formula that adds lots of volume and is long-lasting without smearing. 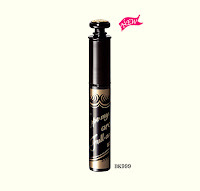 It contains "Volume Up Powder" and "Gloss Oil" that ensures that your lashes look lush and glossy even after the mascara dries down. I'm really liking the whimsical butterfly and rose theme of Chapter 18 as well as the gorgeous blue-green color scheme. For some reason, the website is taking very long to load but hopefully it will get better over the next few days. The Spring collections are slowly arriving in the department stores in Singapore. As of today, Chanel, Shu Uemura, Dior and Anna Sui have all launched their spring collections. The February issues of Voce, Maquia and Biteki also all arrived in Kinokuniya this evening. Both Maquia and Biteki come with the traditional Spring collections catalogue. Biteki also comes with a DVD sponsored by Kanebo Est with makeup tutorials for creating that perfect natural bare skin look. I'm always intrigued by what the wonderful ladies at Tarte will come up with next. 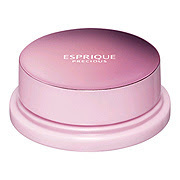 Their new Spring '08 collection has just launched on Sephora.com and it's full of surprises! 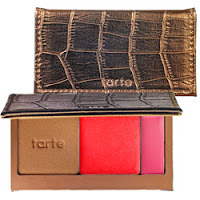 First off, there is Infinite Glow ($30), which includes Tarte's best-selling Mineral Powder Bronzer in Park Avenue Princess, award-winning gel Cheek Stain in Tipsy and a moisturizing 24/7 Lip Sheer in May Flowers, all wrapped in a luxe faux croc compact for easy, on-the-go application. 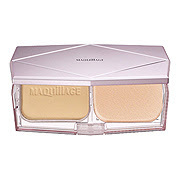 It basically has everything you need to tan, highlight and add rosy color in minutes. 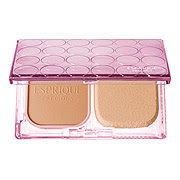 All of the products contain Tarte's trademark skinvigorating™ ingredients, including vitamins A, C and E, mineral pigments, jojoba seed oil and beeswax. Next up is Double Dose ($21, 4 shades), a high-shine, colorful lip gloss with the added benefit of an infused superfruit vitamin complex. 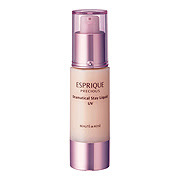 It claims to deliver a dual-powered dose of beauty and treatment. The inner berry boost is a T5™ concentrated pigment that mixes with the outer high shine gloss. 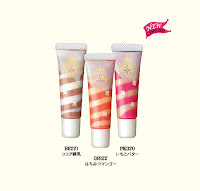 The result is a rich color that helps rejuvenate your lips. The Tarte T5 Super Fruit Complex™ is a proprietary blend of the five most active superfruits: goji, acai, maracuja, acerola and pomegranate. The first blend of its kind, the T5 Super Fruit Complex™ is loaded with naturally occurring, antioxidant-rich nutrients and vitamins that have been known to deliver refining, antiaging and skin-restorative benefits with each application. 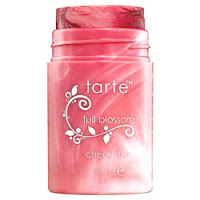 Tarte's cheek stains are what landed them on every beauty editor's list of top picks so it's not surprising that the ladies at Tarte have whipped up another pretty cheek stain to tempt the hearts of makeup addicts. 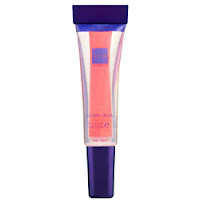 Natural Swirl Cheek Stain ($28) is described as an all-natural swirled cheek stain that combines two universally flattering shades of their best-selling Natural Beauty Cheek Stain, infused with a proprietary T5 Super Fruit Complex™. I'm lemming this so badly but just can't justify it seeing as how I've barely made a dent in my Natural Cheek Stain but the good news is that Natural Swirl Cheek Stain looks like it's permanent! Rejuvelash ($16) is declumping "lash exhilarator" that revives lashes while treating and protecting them from brittleness and breakage. 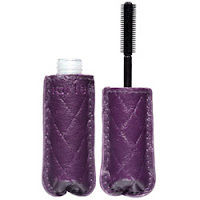 It uses a blend of emulsifying agents in combination with Tarte's patented flexible bristle brush to gently eliminate clumps while delivering herbal hair restoratives with every application to improve the overall quality of your lashes. 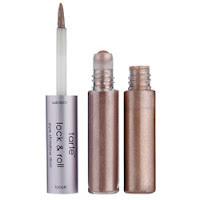 And finally, Tarte has introduced several new shades of its Lock & Roll Creaseless Eyeshadow Duo ($17). 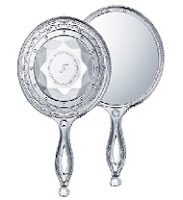 Inspired by Venetian glass and the old saying that 'diamonds are a girl's best friend', Jill Stuart's new Swarovski-studded hand mirror (3150yen) which features a "Brilliant Cut motif" will be launched in Japan on 22 February. Another irresistible must-have item to add to those Japan shopping lists! 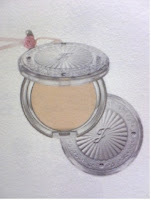 In March, Jill Stuart will be launching a new powder foundation and also revamping the foundation case. Pic from 2Channel.